All belts are made from Genuine Italian Calfskin. Your Choice of gauge: 12, 16, 20, 28, or 410. $89.95 for sizes 32" to 44", Add $15.00 for sizes 46" to 54". 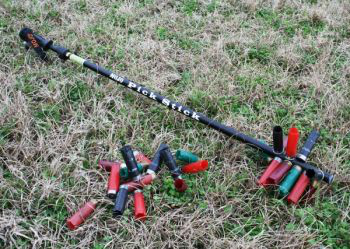 The MOJO Pick Stick is an easy and convenient way to pick up empty shotgun hulls in the field. Shooters will no longer have to bend over or get on their knees to retrieve spent hulls from wet, muddy or messy surfaces. This lightweight, adjustable pole, which has a comfortable padded handle and convenient wrist strap, allows a box of 25 spent hulls to be retrieved at one time that can then be easily raked off into any container. 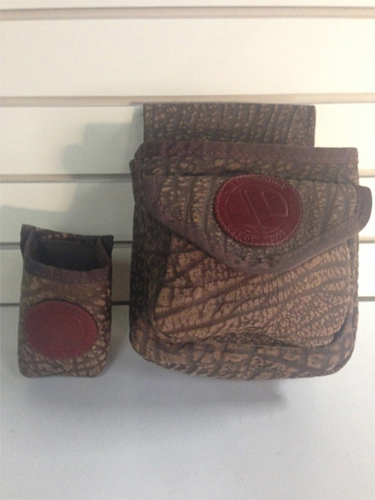 Made from genuine cape buffalo or standard brown calf skin leather. You’ll never have to worry again about where you set your drink down. Custom logos with minimum order of 25.